1. Check the carrier bearings for wear and rough rotation. If they rotate smoothly and their rollers show no signs of wear, the bearings are OK.
2. 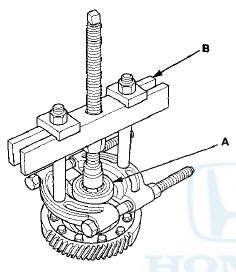 Remove the carrier bearings (A) with a commercially available bearing puller (B). 3. Install new bearings (A) using the 40 mm I.D. driver handle (B) and a press (C). Press on each bearing until it bottoms. There should be no clearance between the bearings and the differential carrier. NOTE: Place the seal part (D) of the bearing towards the outside of the differential, then install it.